Chai is an integral part of life in India and simply translates to ‘Tea’ in Hindi. Calling it ‘Chai tea’ is considered redundant. 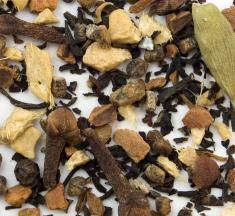 In India, ‘Chaiwallahs’ (tea vendors) are present at street corners brewing basic black tea with spices. The tale of ‘500 Mile Chai’ originates from the many late night truck drivers stopping at small Chai stands ‘Dhabas’ on the highway and asking for really strong, sweet Chai to help them drive long distances (in a humorous tone – “for another 500 miles”). 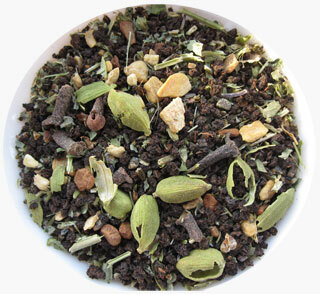 This is a good chai – and it is quite different from many other chai blends that I have tried. 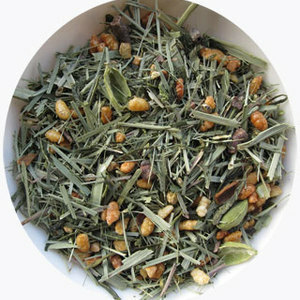 In many other blends, it seems as though the emphasis is on the spices, and it can be sometimes difficult to discern the flavor of the tea base amid the stronghold of the spices. When steeped for the right amount of time, however, this is a delicious tea. I found that 3 to 3 1/2 minutes is just right for me. When I got to four, the tea verged upon bitterness, but at 3 1/2 the tea tasted just perfect. I did not steep this using the chai “stovetop” method (steeping in simmering milk on the stove) because as I’ve attested to in previous reviews, I try to avoid this method whenever possible. Too messy! So, instead, I steeped for 3 1/2 minutes in boiling water. I tried this latte style (steeping at a stronger concentration and serving with steamed milk) and without the milk, and while I prefer it latte, it is quite delicious either way. I do recommend a little honey or agave nectar though to help bring out the richness of the spices. The flavor of the cup is bold and well-spiced. Invigorating! The blend of spices is well-balanced. In some blends, the ginger or cinnamon is overwhelming and can cancel out some of the notes of the cardamom and cloves, but here, each one of these spices is nicely represented without one stealing the show. This is DEFINITELY strong enough to keep you going another 500 miles! 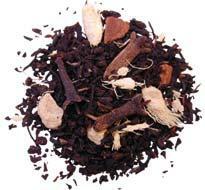 Fair Trade Organic Rembeng Estate Assam tea is the perfect match for our organic chai spice. A robust full-bodied CTC tea favored by chai drinkers in India for its strong malty taste even when blended and boiled with chai spice, milk and sugar. Street chai wallahs tend to use the less expensive fannings or dust tea when making chai as they get a better return on their endeavors. If you are looking for a mighty strong Chai – give this one a go-around! It’ll put hair on your chest! (As my Grandfather used to say). And if it’s not strong enough as-is this wonderful company has SPICE ONLY options available and you can add as much additional spice as you want! BUT…this is a mighty strong chai on it’s own tho! 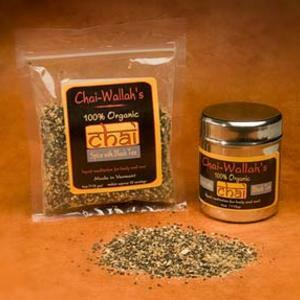 Spice With Black Tea from Chai Wallah has a DARK Brown almost coffee brown-on the verge of-black look to it after infusing. The spices are in full force! I can taste the Black Pepper first then the Cardamom followed by the cloves, ginger and the Cinnamon isn’t as strong as the other ingredients. This one I may try additives with…on future attempts. As many of you know I drink all of my teas plain – even Chai. I like to taste the natural “as-is” flavors without any interruptions. But after I do know what the natural taste tastes like I’m not opposed to experimenting! Regardless…this is a strong and hearty chai! What a Wake-Up Call! Sturdy and loud! It sure has attitude…and I LIKE that! 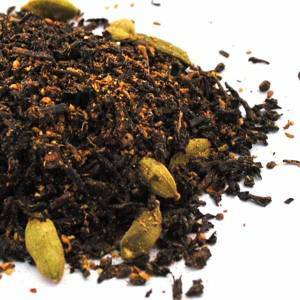 This organic, Fair Trade Certified Masala Chai Black Tea blend has a medium-body with exceptionally spicy flavor and aroma. This formula is based on traditional South Indian blending methods and ingredients, using a CTC leaf grade (i.e. very small), as well as green cardamom, cinnamon, ginger, cloves, and black pepper. Despite the CTC grade leaf, this tea has surprisingly little astringency. The clove and ginger really come through, with a wonderful cardamom finish. We recommend steeping a triple-strength cup of our Masala Chai Black Tea and serving it with honey and steamed milk. Ingredients: organic black tea, organic green cardamom, organic cinnamon, organic ginger, organic clove, and organic black pepper. I have wanted to try this chai ever since I reviewed the Masala Chai Tea-Infused Chocolate Truffle from Arbor Teas in November. And I am so glad that I’ve finally had that opportunity, because this is a remarkable chai! I steeped this just as recommended in the description from Arbor Teas (which I’ve included above), I steeped it extra strong and then served it with honey and steamed milk. AWESOME! This makes a delicious chai latte. First of all, I must say that I love that Arbor Teas recognizes that we don’t all just want to stand at our stove and brew chai tea using the “stovetop” method. Get real! It’s messy and to be quite honest, there are few things that I enjoy heating on the stove less than milk. 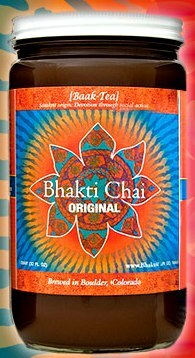 This chai tastes great when brewed at a concentrated strength in water, and then adding steamed milk to the brewed liquor. It is a chai after my heart! The black tea base is strong but not bitter and there is very little astringency to it. The astringency – what little there is – seems to nearly vanish after the steamed milk is added. It is smooth and rich tasting, and I love that it is organic too. The spices are nicely balanced in this blend, and they stand up well to the addition of steamed milk. The pepper seems to stand out for me, but I like pepper in a chai so that’s not a problem. It doesn’t overwhelm the other spices – it just adds a new level of warmth to this chai which I am finding to be remarkably complex even with the addition of milk.